Xiaomi did something crazy back in May when they announced the Mi 8 which kind of competed with the Mi Mix 2s, an almost similarly specced device, that was launched a few months earlier. Although the Mi line is their flagship line, how does the Mi 8 compare to the Mi Mix 2s? Let’s found out in this specs comparison. Judging by the summary above the Mi 8 has the Mi Mix 2s beat but let’s take a deeper look. Display-wise we have two different configurations despite the similar resolution. The Mi 8 comes with an AMOLED display, while the Mi Mix 2s has IPS. These panels almost have the same quality except AMOLEDs have deeper blacks and more saturated colors while IPS has more natural colors. Viewing experience will be a tad better on the Mi 8 though thanks to its generous screen-to-body-ratio and bigger display. Both devices are rocking a Qualcomm Snapdragon 845 processor and 6GB of RAM. So, performance will be close, if not identical, to each other. Even storage capacity is the same, with both phones having 64 and 128GB variants. Now on to Cameras. 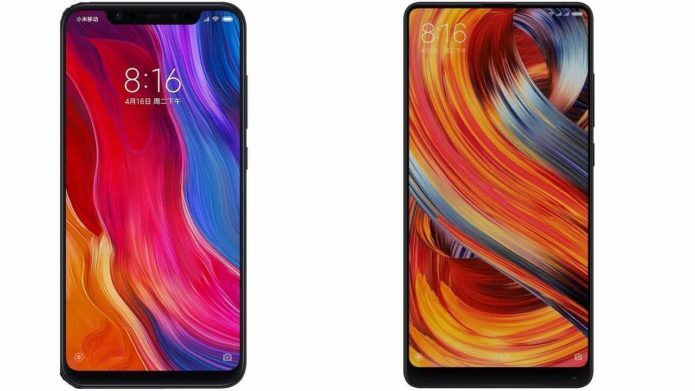 Judging by their specs, the Mi 8 and Mi Mix 2s has an almost identical rear camera setup — Dual 12MP shooters with AI. Performance of the rear pair for both will, give or take, be similar or with only minor differences. In any case, both will perform admirably in providing great photos even in low-light situations. The front cameras are a different story. While the Mi Mix 2s still has a respectable 5MP front shooter, the AI 20MP of the Mi 8 provides better selfies. Add that to the fact that the former has an awkwardly placed front camera that can sometimes be cumbersome to use (It’s located at the chin of the device). In this case, looks like more megapixels won the fight. Battery performance is also a mixed bag for the two. Both have identical capacities, at 3,400mAh, but offer different charging gimmicks. The Mi 8 has the faster QC4+ while the Mi Mix 2s has wireless charging. Based on our reviews, the Mi 8 has a longer battery life than the Mi Mix 2s with the former lasting for 20 Hours and 35 Minutes while the latter with only 13 hours and 27 minutes. Xiaomi clearly fought with themselves here but at least they gave the Mi Mix 2s a little bit of time to shine before it became overshadowed by the Mi 8. Although in this specs comparison, it’s clear that the Mi 8 wins the fight.